Every month, at 91mobiles, we take a look at the top 20 mobile phones in India as per user searches. The list helps in separating the wheat from the chaff and see which devices are actually able to get the attention of the consumers. And now, as we are getting closer to the end of 2018, it’s time for the yearly edition of the list, and see which 10 smartphones ruled the roost. So without further ado, let’s begin. To say that Samsung’s Galaxy J series helped the brand against the onslaught by Xiaomi (and other Chinese brands) wouldn’t be wrong. The Galaxy J6 is the brand’s most affordable offering with an Infinity Display, and draws power from an octa-core Exynos 7870 processor working in tandem with 3GB RAM. OPPO was among the first few brands to offer a teardrop notch with the F9 Pro, allowing for a higher screen-to-body ratio without the distracting rectangular cut-out on top of the display. The F9 Pro also gained popularity due to its dual rear cameras and AI-infused 25-megapixel selfie snapper. Under the hood, the phone comes fuelled by the Helio P60 SoC and 6GB of RAM. For a new entrant, Realme has surely come a long way. Following up the launch of its debut offering – the Realme 1 – the successor also brought some interesting features such as a notch and Snapdragon 450 SoC in the budget segment. The 6.2-incher comes with a powerful 4,230mAh battery and dual shooters on its back. Accompanying its sibling, the Galaxy J8 also comes with a 6-inch Infinity Display. It features similar specs as the Galaxy J6, but boasts dual cameras on the back and a beefier 3,500mAh cell. The smartphone is also among the very few offering from the Chaebol’s stables to come powered by a Qualcomm chipset (Snapdragon 450). While the iPhone X kickstarted the notch trend, it was the Vivo V9 which brought it to the mainstream. The latter’s 6.3-inch IPS panel features a cut-out on top which is home to a 24MP selfie shooter along with other sensors. Powering the show is Qualcomm’s Snapdragon 626 processor, which is mated to 4 gigs of RAM. Considering Xiaomi’s Redmi Note series have always topped the popularity charts, it’s not a surprise to see the Redmi Note 5 in this list. However, due to the presence of a more powerful sibling (in the form of the Redmi Note 5 Pro), the Note 5 has been relegated to the fifth place. The brand’s first Redmi series phone rocking a bezel-less display continued with what makes the Note series great – good specs with a strong battery. The Redmi 6 Pro is the brand’s most affordable handset with a notch-toting display. But that’s not the only thing that makes it an interesting package. The device features Qualcomm’s Snapdragon 625 processor, 12MP+5MP snappers on the rear and a power-packed 4,000mAh battery. The Realme 2 Pro was the third launch from the debut brand, and garnered headlines for being the most affordable smartphone with Qualcomm’s Snapdragon 660 SoC and a waterdrop notch. Bearing a 6.3-inch full HD+ display, the device sports a 16-megapixel snapper at the back, which is accompanied by a 2MP depth sensor. Unlike the Redmi Note 5, which was simply an iterative upgrade over the Note 4, the Note 5 Pro features significant upgrades. 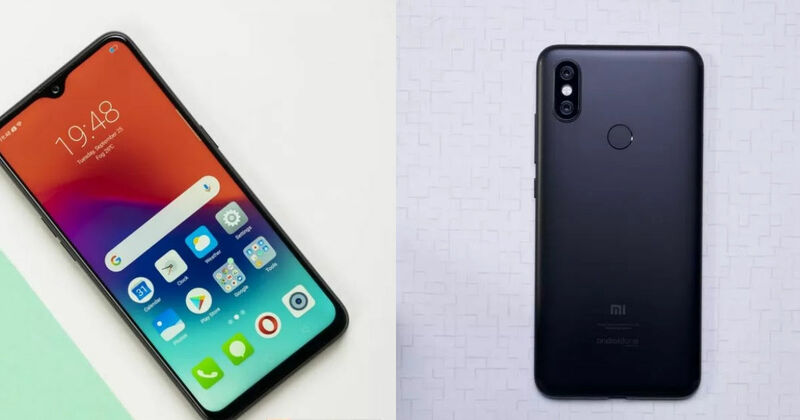 It packs dual rear cameras comprising 12MP + 5MP cameras, a high-res 20MP selfie snapper, and a more powerful Snapdragon 636 chipset, along with being made available with 6GB RAM (the base model ships with 4GB RAM). Now, this was a surprise – a pleasant one at that, indicating how popular stock Android / Android One is. The successor to the Mi A1, the A2 sports a bezel-less 5.99-inch screen and comes equipped with the powerful Snapdragon 660 chip. At the back, it sports 12MP + 20MP cameras, while a 20-megapixel snapper takes care of selfie requirements. Xiaomi’s Mi A2 was also the first handset in India to support Qualcomm Quick Charge 4.0 tech. Taking a tally of the 10 most popular phones in 2018… while the presence of four phones from Xiaomi in the list isn’t really a surprise, the fact that Realme had two its offerings in this list is certainly interesting. That’s because the brand has tied with Samsung, and it means that if Realme continues with its value proposition, it could become the one to watch out for. Another interesting thing worth noting is that barring OPPO’s and Vivo’s devices, both of which were launched in the Rs 20k+ segment, all the other devices are priced in the affordable category. We’ll keep bringing you more insights from the yearly popularity data, so keep an eye out for that.